I am a member of several open groups on Facebook, and I notice that in the group people are posting quite large posts. The suggestion from the group owner was that maybe the limit is different for groups. Anyone know if you can alter the personal limit? I need to do this for a business customer FB page I am creating. Status updates must be less than 500 characters. You have entered 2,400 characters here. Notes can be much longer. Would you like to edit and post your update as a Note instead? 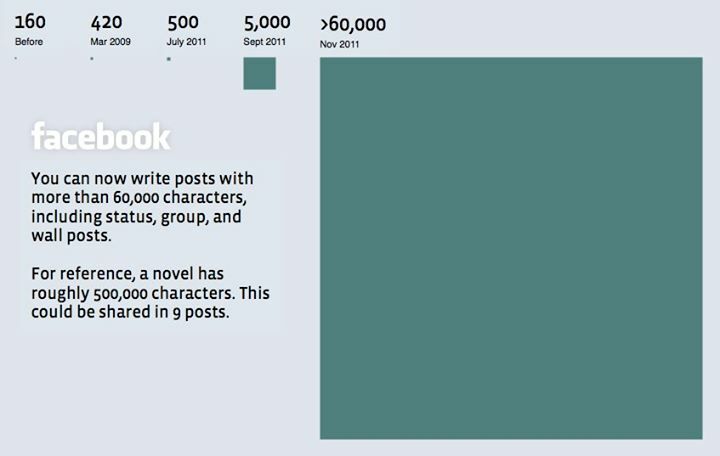 You are currently permitted to post up to 63,206 characters on Facebook in a status group or wall post. There is no difference. What's the difference between a list and a group on Facebook? Is there a character limit on Facebook private/direct messages? In Facebook, What is the difference between share and “who should see this”?